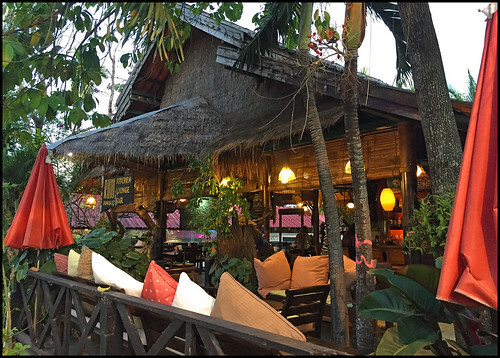 So many restaurants to choose from in Phuket! Impossible to blog them all, and we have a few favourites that we visit regularly. Also .. we're not on holiday here, so we don't eat out every day! We might eat out once per week, sometimes twice. And when I say "eat out" I often mean just a simple Thai restaurant with cheap local food. We're not eating steak and seafood buffets and guzzling wine! Most of the time we stick to Thai food. But we wanted to try Rum Jungle although it's not our normal kind of place. For one thing, it's close to Nai Harn Beach, which is about 20km from home in Kathu. We don't go out around Nai Harn very often. My wife and I used to enjoy driving around here 15 years ago when it was very quiet, but these days we tend to eat more around Phuket Town, close to home. Rum Jungle has been there for many years, a well known place for "Western" food. 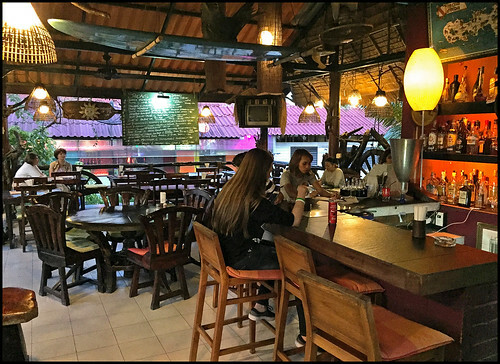 The Nai Harn area has many restaurants which do all kinds of non-Thai food. Partly catering to tourists, but also to foreigners living in that area. 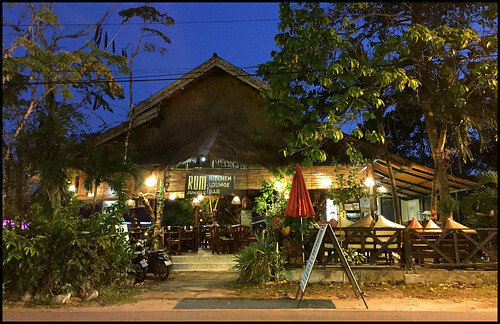 This corner of Phuket around Rawai and Nai Harn beaches is a popular location for foreign residents to settle. We decided to try Rum Jungle, as our kids had become friends at school with the owner's kids. Rum Jungle used to be on a quiet street actually surrounded by jungle. But the area has developed a lot recently and there are shophouses, banks, bars and various businesses nearby. There's some parking around the back. It's not particularly noisy although the road was busier than I remembered. I crossed over to take the photo above and had to wait a couple of minutes for a gap in traffic to cross back! It's not a huge restaurant, might seat 40 people if totally full. On the evening we ate there, about 4 or 5 tables were occupied. There are a few seats at the bar too. It's a funky jungly kind of place. Owners Tony and Jo have been running it for 10 years. Tony is Australian of Italian descent and speaks fluent Italian. The menu is all European - lots of pasta, steak, Italian dishes and there's a daily specials board which on this day featured such dishes as lamb shank, duck breast and spinach & ricotta ravioli. This I think will be a place to treat ourselves sometimes. Menu prices range from under 300 Baht to over 600 Baht. 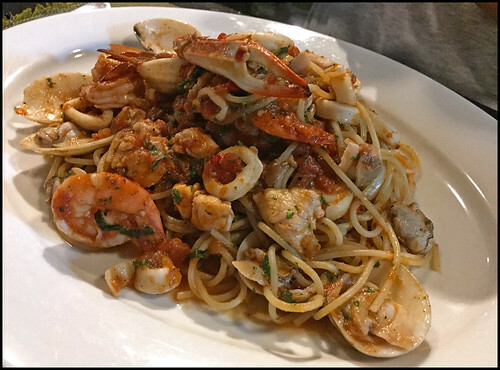 I ordered chicken parmigiana, my wife ordered spaghetti frutti di mare, and my son had carbonara. I think I need to again for a steak. (above) There's some cushiony outdoor seating too, more suited to people who just want a drink, or a place to sit with a drink after eating. 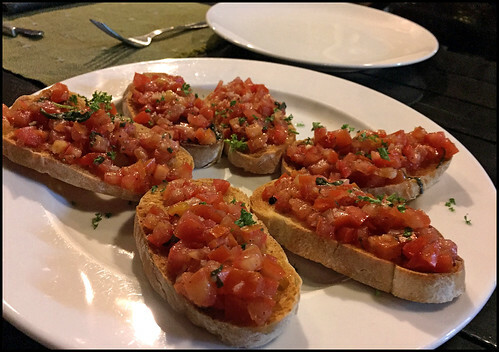 Some fresh, warm homemade bread came to our table first, soon followed by a starter - some very tasty bruschetta. Our son was a little suspicious of this .. tomato on toast? But he had a nibble and then ate more than half the plate! Reminds me of when my kids tried gnocchi for the first time .. what the hell is that, Daddy? Is it food? So go ahead and try it, kids ... Om nom nom! I would have ordered more bruschetta, but the main dishes were not far behind. 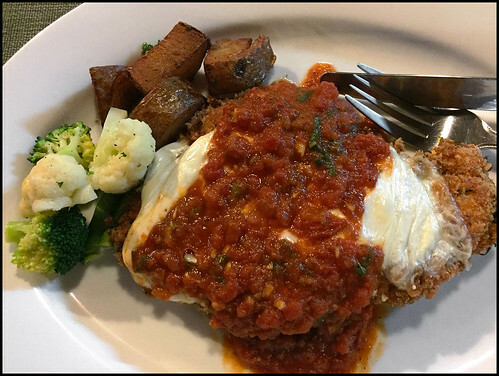 (above) Chicken Parmigiana - again, this was a big plate - a huge piece of chicken smothered in mozzarella and herby homemade tomato sauce with a few veggies for good measure. We were all stuffed. Apparently they have some decent wines here too, but I am not a wine drinker, I just had a couple of beers with dinner. I think our bill was about 1400 Baht - our daughter did not eat, she'd already eaten pizza with friends before we went for dinner. This is more than we normally spend for dinner, but we don't normally go for this kind of food, and the portions were rather huge. A friend of mine eats there quite often and recommends the fish dishes. So we'll be back!